High Season Rate discounted to $325/night 4/22/19-5/1/19 due to cancellation. Take advantage and come enjoy epic sunsets at Casa Nicoya! Casa Nicoya in Sayulita is a beautiful three bedroom hilltop vacation home, which can be rented with an additional 1 bedroom casita for a total of 4 bdrms, conveniently located on Gringo Hill, just a 5-7 minute walk from the Plaza and Beach, with ocean views and stunning sunsets to be enjoyed from every floor. Relax by the pool, grill up some dinner, nap in a hammock or read a book in one of the many comfy lounge spaces and enjoy the tropical breezes this unique indoor/outdoor floor plan has to offer. The Main House at Casa Nicoya is comprised of three bedrooms, and three and a half baths on two levels, each with their own fully-equipped kitchen and lounge area. Perfectly situated overlooking twinkly Sayulita you will enjoy taking in the ocean to the North, and breathtaking sunsets to the West. The first floor includes an en-suite queen bedroom with its own spacious bathroom and a brand new A/C unit. The second floor is like sleeping in a treehouse with sweeping views and jungle breezes. There are two bedrooms, a Queen bedroom newly enclosed with glass sliding windows a brand new A/C unit, and an open-air King bedroom with curtains for privacy, each with their own bathroom. The King can be converted to two Twins if desired. These two bedrooms share a second kitchen and lounge area. Every bedroom in Casa Nicoya has roomy closets, a state-of-the-art keypad safe for your valuables, hair dryer, fan and mosquito net for your comfort. The one bedroom, one bath Casita with full kitchen, and A/C can be rented separately, or in addition to the main home for a total of four bedrooms if you wish to have the entire property to yourselves. When not rented, the garage entrance and pool area may be shared with owners when in town a few months a year. Disconnect completely or work remotely from the hammock, our wifi is strong enough for your Skype calls. Maid service is twice weekly and drinkable water is provided on every floor. We are happy to share booking information for airport pickup, golf cart rental/delivery, local activities, or share our favorite spots to surf and eat, just ask during booking! Please use the contact form to get in touch, by email or telephone, with any questions and to arrange your stay. We look forward to welcoming you to Sayulita! Casa Nicoya is a wonderful home with an amazing view in a perfect location. The hosts, the property manager and the housekeeper were all extremely communicative, helpful and very informative. Our stay was amazing and we’ll definitely be back. Thank you team!! Can't wait to return to this amazing place. Great location with amazing accomodations! loved how close this house is to town - literally a 5 min walk. the bedrooms are clean and comfy and the pool was amazing! my entire family enjoyed our stay. Lisa (owner) was wonderful in sending us info prior to our stay and so helpful during the week we were there. I would definitely recommend Casa Nicoya! My favorite vacation rental in Sayulita! I had stayed in Sayulita a couple times prior but I have to say this was my favorite spot so far. Clean and well decorated home. Beautiful sunset views. Felt far enough from town to get some peace and quiet but with a super convenient stairway right by the house we were down at bars, restaurants, the beach in 5 minutes. Lisa and Eric were great hosts and the property manager, Zoey was very attentive and helpful. Can’t recommend it enough! Casa Nicoya is the ultimate Sayulita experience, and it all starts at your home away from home! From the minute we booked, till our departure from Casa Nicoya, this house met and exceeded all of our vacation needs. Communication from the owner is dialed in, and they went above and beyond to make sure we felt comfortable during our stay. THE HOUSE! Casa Nicoya is beautiful to say the least. The taste and style of this house really shines through with ease. We found ourselves wanting to experience the house... just as much as seeing the streets filled with flags and colors in town. Definitely a treat to stay here. (We felt we had absolutely everything we needed, kitchen, bathroom, towels, cozy sleeping comforts, etc) and the morning light! Waking up in this oasis is astounding. The location to town for us was ideal, and we loved being close enough to walk wherever we wanted/needed, but also far enough away to avoid the daily noise of the town/nightlife. We really felt as if we just fit right into this cute Mexican town, thanks to the help of this casa and all of the clear/precise details from the hosts! The pool area is magical and inviting, perfect for taking a break and relaxing. And all of the cool little nooks in this house are truly amazing. I can’t say enough about how much we thoroughly enjoyed our stay. Casa Nicoya just gets it! Book it! You’ll fall in love. Very chic space with great views and open living. High above town with expansive views but only a 5 min walk to get to anything. The pool area is very relaxing and landscaped nicely. A great vacation experience in Sayulita. It’s hard to believe but the pictures don’t even do this place justice. It’s such a sanctuary and the open layout and beautiful decor make it the perfect hilltop escape. Be prepared to walk up quite a few steps from the pool to the top floor and uphill from the town but everything is so close (maybe 6 minutes to all the restaurants and a couple more to the beach) and the views are amazing. The open layout was beautiful and we didn’t have any bugs so sleeping essentially outside was such a great experience. The animals (birds and donkeys) were a little noisy in the mornings but that’s what makes it feel like you’re on vacation somewhere otherworldly. The house manager and Lisa were super responsive and helpful too. We’ll definitely be back! Casa Nicoya is spectacularly located on the hill very close to town yet still feels relaxed and restful. 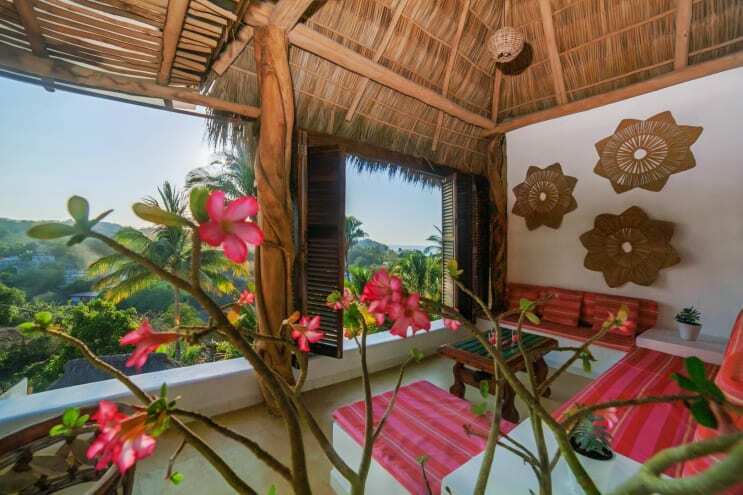 Amazing well designed and beautifully decorated open spaces with everything you need for a great stay in Sayulita. Lisa gave us great tips for local activities and provided everything to make our stay relaxing and so much fun for our family of 6. Lisa is a great host and I can’t imagine a better place to stay. Can't say enough good things about our stay. The house is wonderful and well-designed but still comfortable. Plenty of space to hang out whether at the pool by day or on one of the terraces by night. It's a little bit of a walk up the hill but very worth it for the peace, quiet, and amazing view. The neighbors even gave us rides on their golf carts from time to time. Highly recommended all around! Holidays: (Christmas, New Year, Semana Santa/Easter) Only available as 4bdrm rental for holidays. Holidays: (Christmas, New Year, Semana Santa/Easter) $420 USD per night for entire 4 bdrm/4.5 bath/3 kitchens with Casita. During holidays we require the entire 4bdrm house be rented. 5 night minimum for Thanksgiving, 10 night minimum over Christmas. *All bookings will include an additional cleaning fee and security deposit. In 2013, my husband (Eric) and I quit our fast paced Bay Area tech jobs to backpack around the world for a year. And after a year of exploring, we just. couldn't. stop. One year turned into four as we have transitioned into our dream life of working remotely while traveling the world. We now split our time between Sayulita, Lisbon, San Francisco/Tahoe and "somewhere new and exciting". We are always eager to explore new cultures, learn a new language, and make new interesting friends. Extra passport pages are evidence I am living the life I want to live.We are grateful to have traveled to many fabulous places in the world, and found ourselves looking forward every year to our stint in Sayulita. So we decided to plant some roots, and bought a home in Sayulita that allows us to live here in the Casita a few months a year while renting the main house to fellow travelers like you!We welcome you to our dream home in this magical Pueblo and look forward to sharing it with you!